New Sherlock Apparel "It's Elementary Watson"
Sherlock Holmes "Eliminate the impossible...."
This design feautures the screen printed quote on an American Apparel top which is more lightweight than a sweatshirt but with the same comfy slouchy style. Taking inspiration from the legendary sleuth 'Sherlock Holmes', I have also recreated the quote on a black flowy Bella & Canvas dolman sleeve slightly sheer t-shirt top in grey. This is the black version of the flowy Bella & Canvas dolman sleeve slightly sheer t-shirt top. No Sherlock fan's home would be completed without some cute cushions! These cotton cushion covers are available in red, black and white! Sherlock Holmes "Eliminate the impossible...." Mug, 2 sided design"
All great detectives require a liquid beverage to stay hydrated while solving crimes! Get your Sherlock fix at the same time with this double sided design featuring the same quote and as an added bonus a vintage 'Sherlock's silhouette. 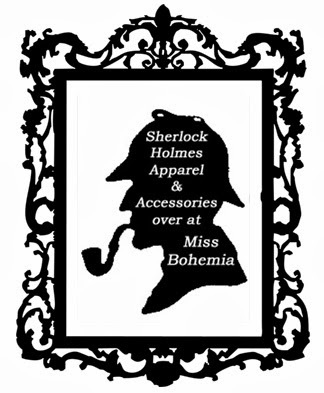 All featured designs are available at www.missbohemia.com and more Sherlock goodies can be found here!